The potential dangers I face everyday. I face everyday with the threat of my very sneaky, highly stealthy cat of whom I think my husband has secretly trained as a ninja killer kitty. I have never caught Marabelle (aka: Mary) doing this but I have to check everyday the whole length of my oxygen tubing for little tiny teeth puncture holes. These holes slowly bleed the much needed oxygen from the tubing leaving me with less oxygen. I bet you are wondering why I haven’t banished this crafty kitty. *sigh* I just love her so much. Besides, I have duct tape. No, no, I don’t duct tape my cat! Heavens no! The duct tape comes in handy for quick fixes for when I need to wrap the tape around the nearly chewed in half area of my 50 foot oxygen tubing to make it sealed and to fix the leak. My house is never without my handy duct tape which comes in all sorts of lovely colors. But mine is white. Now I bet you are wondering what more possible dangers could there be? Well… I’m not the most graceful person when it comes to coordination. Walking a straight line is not my thing when I’m tired. 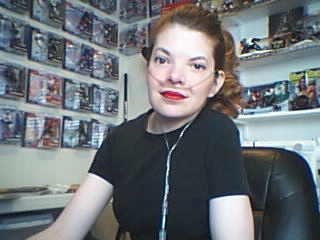 There have been a time or two when I’ve been walking in the house while doing chores (carrying the full laundry basket to the bedroom) and my feet get tangled up in the oxygen tubing. I end up barely catching myself when I trip. But, once or twice, I’ve face planted on our hardwood floor. There are times when people will accidentally step on my tubing as I’m walking away (that’s usually my husband, K). This really hurts my face and ears because I’m walking away and it jerks me back. Sometimes the canula gets ripped from my face and my nose pays the price. Sometimes I even step on it myself. Remember, I’m not a graceful person. This even happens with my portable oxygen tank too because I’ll start walking one way when K is going the other way and I forget that we are linked because he has the oxygen portable with him. I’m so use to using oxygen that it’s not a conscience thought any more. It’s just part of me now. So, you see? Not only am I a rebel… my husband always says that when I’m around, chaos just swirls around me! Isn’t that so cool?? I tell him, “Well, at least I make your life interesting!” Then, of course, I proceed to laugh when I see the look on his face. He’s so priceless. I’d never, ever trade him in for a newer model! Haha! If you are new to my blog, don’t miss any posts I make. Sign up to FOLLOW my blog. Check the right column to find out how to receive emails for when I post on this Living On O2 for Life blog. I wish you all a wonderful weekend. I hope everyone got their flu shot (don’t forget the pneumonia shot too if you haven’t had it in 5 years.) Take care and be well. Hahaha! This was so funny. Attack cat extraordinaire, Ninja Killer Kitty! Yeah, I loose my balance too and they don’t know why. I hit the floor and broke a rib a few days ago. In a lot of pain just now. Please send fruit baskets, grilled meat, pain killers and laxatives. Quick!!! OUCH! Sending lots of gentle hugs your way! Try not to hurt yourself again! !